Is This The Lamest Move In Motorsports History? You know when a soccer player flops and pretends to be injured? You know how you shake your head when it gets caught on camera but the ref doesn't see it? Yeah, this is the same, but in a motorcycle race. 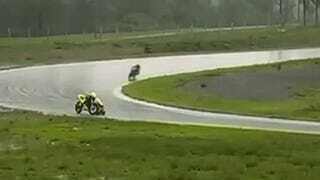 Here we see a racer in a low-level Brazilian motorcycle race take a spill on a very wet track. He tries to get his bike going, but when he finds that it's broken, he pretends to be hurt and gets the race stopped. Little did he realize that in this day and age everything is on video, so he was promptly shamed by his entire nation and deservedly so.